Castellabate is a mountain town in Cilento, southern Italy. It is located south of Agropoli. This town was featured in the funny Italian movie, “Benvenuti, Sud”. This DVD is only available in PAL (European format) but does have English subtitles. It is a very funny movie about the perceived differences between the north and south of Italy. We laughed all the way through this movie. Like so many seaport areas of Italy, this town has two parts. One is called Santa Maria Di Castellabate and is on the shore with beautiful beaches. It overlooks the bay and you can see the tip of the Amalfi Coast and the Island of Capri. 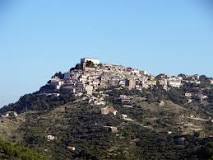 The other is a fortified mountain town called Castellabate. This is a pedestrian town only. You park in one of several parking lots and walk into the center. The views are spectacular. You can see the entire Amalfi coast and Salerno. You can take a ferry to various towns on the Amalfi Coast. From here you can go to the large city of Agropoli or father north to Salerno. You can also visit the Greek ruins at Paestum (about half way between Salerno and Castellabate. There are hundreds of small beach and mountain towns waiting to be explored. Take your time because each little town has its own treasures to be discovered.